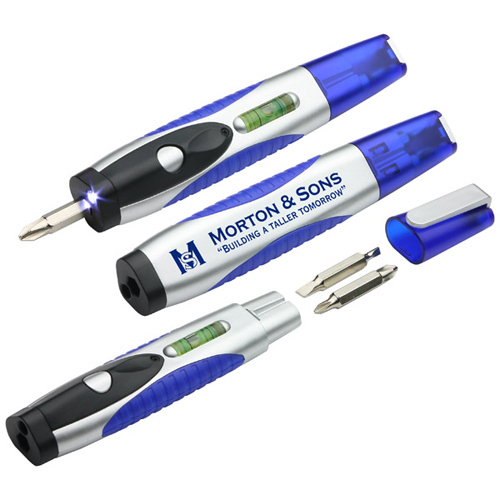 Featuring a flashlight, a level and a screwdriver, this level light screwdriver pen is the perfect tool for any job.This pen showcases a capped end with a pocket clip that stores two flatheads and two Phillip's head bits. 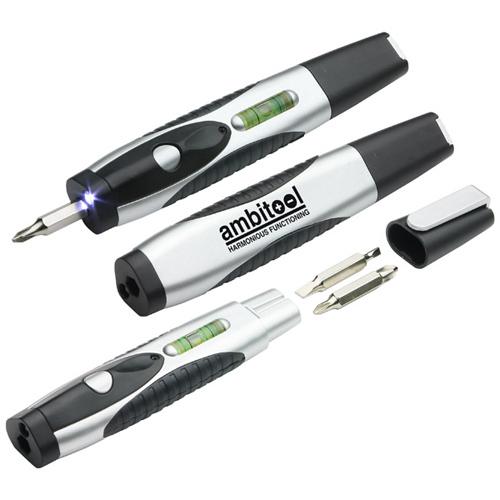 This compact, quick-fix tool has been safety tested and comes with two button batteries included. This product is intended for adults and general use by consumers of all ages. Not for children under 3 years and pets. The Set-up charge varies per product. It is required by the factory to set-up the machines, materials and products that will be imprinted with your logo and/or artwork. For example the set-up charge is used to create silk screens, tapes, dies and molds. Each product and/or imprinting method requires a different set-up process. The set-up charge is not based on the quantity ordered. A setup is the same whether the order is 20 pieces or 20000 pieces. The fee is applied per imprint color and imprint location. Run Charges cover production costs associated with optional decorating and/or optional packaging that is not standard to the item. For example, a run charge will be added for decorating in a secondary position and/or secondary color. Also, decorating using a large number of colors or gift box packaging rather than bulk packaging will incur run charges. Run charges are applied per imprint color and/or imprint location for each item ordered. Additional Charges are things such as packaging fees, additional product accessories and options. When you select to order Blank Goods, you are ordering the product with no artwork personalization. Here you will find basic information about the product such as packaging, order increments, additional charges, package count, weight per box... etc. 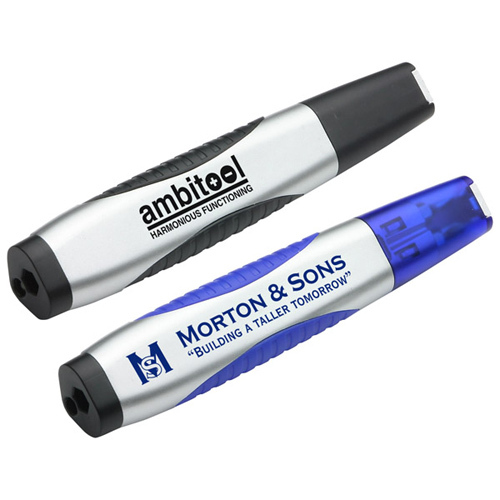 Minimum Orders for this promotional item are listed as the first price column. You must order at least the minimum for customized or blank merchandise. 5-1/2" x 3/4" x 1"
Bulk / 20 lbs / 160 pcs. / 13 x 11 x 11box. Production time is the time it takes to print and package merchandise. It does not include the time it for order processing and proof approval. Depending on the product, rush production may be available. Standard production time varies. It is dependant on product, manufacturer, and printing method. Rush production is available on a selection of products in our catalog. Rush production is sometimes called Rush Service or Rush Imprinting Service. Rush service can vary from 24hrs to 72hrs. Most rush items are limited to a one color/one location imprint. When ordering a rush product please be sure to review the rush service terms. 5 Business Days *Production time begins after artwork approval and does not include shipping time. Note: 1) Every order is unique and additional charges that are not listed may apply. For example, additional charges may be required for imprint color changes, copy changes, product assortments, packaging, etc. Price subject to change without notice. 2) Due to difference among color monitors, the colors that appear may not be exact. The imprint area is the allowable portion of a promotional product reserved for the printed advertising message. All artwork is different and your artwork may require adjustments in order to print it at it's best without sacrificing quality. The size and placement of the artwork may vary from the proof when actually printed on the product. Proofs are for artwork verification & layout. The area that your logo/message is imprinted. Each product displays the available imprint locations. Set-up charges are different for every item and can be different for each imprint method. They are required to set-up the machinery and materials needed to personalize the products with your logo and/or message. Run charges are also different for every item and can be different for each imprint method. They are additional charges necessary to complete the imprinting of your items. Run charges, for example are added for secondary locations and/or colors. They can also be packaging charges or other options that are not included in the base price of the product. Imprint Area: 3" x 3/8"
The PANTONE MATCHING SYSTEM (sometimes referred to as "PMS") identifies over 500 colors and the formulas for creating ink in those colors. Four-color process printing can only approximate many of these colors. You can select PANTONE Colors in various illustration and desktop publishing software programs. These are the standard colors that are kept in stock for each product line. There are currently no product reviews for this product. To write a review please log in.